I have this except the label has blue print. Also, the sleeve is the "Scientist Wins the World Cup" sleeve. Does anybody else own this weird copy? thanks. A wicked collection of dubs from the legendary sessions with Scientist & The Roots Radics that led to the albums "Bounty Hunter", "Shaolin Temple", "Englishman" & "Shine Eye Gal" between 1979 - 1981. Although it's not a complete set, some of the missing dubs can be found on Scientists album "Jah Life In Dub". Still a fantastic disc! 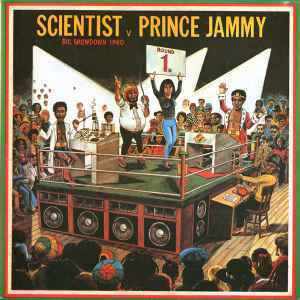 this is still the same LP Scientist V Prince Jammy just with a slightly different song list and dub mixes. the Greensleeves version was geared towards the european market while the Jah Guidance version is geared towards the bass heavy Jamaican sound system culture. Both LP's feature Scientist and Prince Jammy on alternating tracks. This release needs to be added to the master release of Scientist V Prince Jammy and not a "unknown" stand alone release.